The committee of KFCSA are concerned and disappointed that a pyrotechnic was activated by Killie supporters in the East Stand during the cup tie against Rangers. This has previously been an issue with only away fans at Rugby Park and it is worrying that the good name of Kilmarnock FC and its fans could be tarnished by a small number of individuals. We understand that some Kilmarnock fans also tried to ignite a device at Dundee, but it failed to activate. 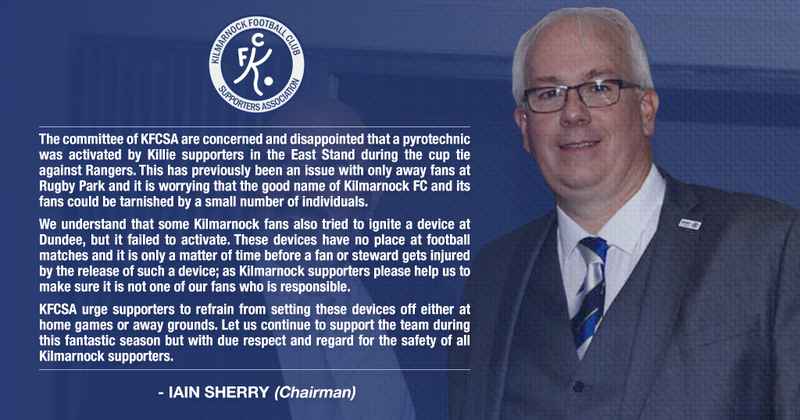 These devices have no place at football matches and it is only a matter of time before a fan or steward gets injured by the release of such a device; as Kilmarnock supporters please help us to make sure it is not one of our fans who is responsible. KFCSA urge supporters to refrain from setting these devices off either at home games or away grounds. Let us continue to support the team during this fantastic season but with due respect and regard for the safety of all Kilmarnock supporters.